Passport Photo Place provides standard and rush service for Mexican tourist, work and temporary resident visas. We take and print Mexican visa pictures that comply to the exact photo requirements provided by Government of Mexico. First, a Mexican Consulate in US must process a visa work application (for lucrative visa). This step requires Mexican Passport Photo size pictures. Mexican Consulate General advises to utilize only a professional legal passport photo studio to avoid lengthy delays and visa application rejections. Passport Photo Place takes and prints visa pictures that 100% compliant with the Mexican Embassy Requirements which helps to ensure that all applications are approved within the normal processing time. We provide photography for FMM (Multiple Purpose Form) visa, FM3 (non-immigrant) visa, FM2 (immigrant) visa and legal resident (inmigrado) visa. Guaranteed Mexican visa photo service. No Rejects! All Mexican visa pictures are taken and printed by the precise and updated requirements as provided by the Mexican Embassy and Consulate General in Miami, FL. All pictures are taken in our studio by a professional legal photographer that specializes in passport and visa photography for all travel and immigration documents. Passport Photo Place produces professional and great looking pictures that naturally represent the subject’s appearance. We utilize the latest and updated photo acquisition and picture printing technology that allows us to produce visa photos for Consulate General of Mexico that fully complies to the official requirements. 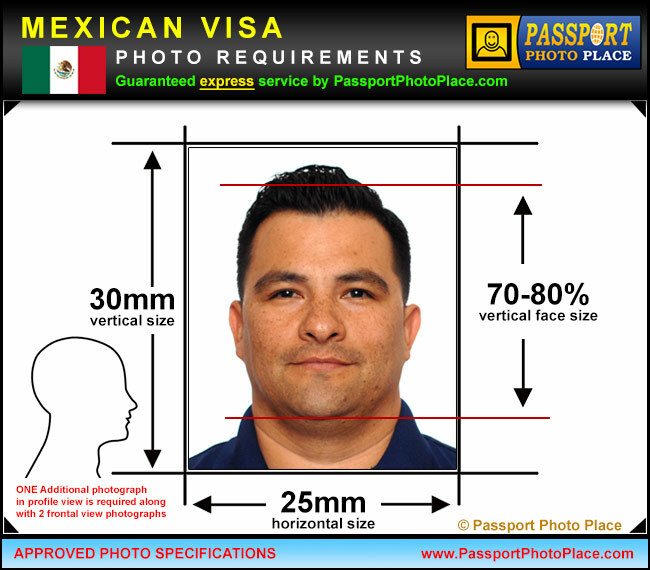 Mexican visa applications require to submit the photographs that follow the below provided specifications. Note that work visas also require a “Mexican passport size” photos to go along with applications processed in US as a first step of the visa acquisition process. Mexican visa photo must be printed at 300dpi resolution or more using a professional dye-sublimation printer. Inkjet printing is not acceptable. Please wear a solid-colored top/shirt. White or slightly off-white tops are not recommended since the background for Mexican visa photographs is white and there must be a good contrast between clothing and the background.